The least expensive method to get to and from most Los Angeles-area airports is to use Metro buses and trains. You can take a free shuttle from the airport terminal to Metro bus and train terminals near Lot C and Lot G. You can take a FlyAway shuttle directly to Union Station (downtown LA), Westwood (UCLA), Van Nuys or Irvine. Use the Trip Planner at Metro's website to find routes and schedules. Shuttle Services and Limousines - serving major airports in the Los Angeles area. Flyaway Bus is a quick and inexpensive method of transportation between LAX and Union Station (downtown LA), Westwood (UCLA), Van Nuys airport and Irvine. The Flyaway Bus picks up and drops off passengers outside every terminal at LAX. The Disneyland Resort Express - bus service between Disneyland (and Anaheim area hotels), and Los Angeles International (LAX) or Orange County/John Wayne Airport (SNA). Operates every day. Buses depart hourly or on the half hour, depending on the time of day. 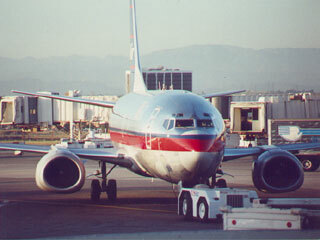 Los Angeles International Airport - (LAX official website) - Links to flight schedules, airlines, businesses at the airport, passenger services, maps, more. Los Angeles International Airport real time flight information - Real time flight arrivals and departures, airport parking and ground transportation. Airport management, airlines location and contacts, terminal map. Long Beach Airport - (LGB) -Flight schedule, Airport businesses. Maps, News, more. John Wayne Airport, Orange County - (SNA) - Directions, Parking, Terminal information, Airline information, Airport facts. Ontario International Airport - (ONT) -Links to flight schedules, airlines, businesses at the airport, passenger services, maps, more. Van Nuys Municipal Airport - (VNY) (limited commercial flights) Links to airports facts and services, businesses at the airport, maps, more. Aircraft Seating Maps - Information on airplane seats featuring the best seat, legroom, recline information. Extensive list of aircraft and airlines. TSA Travellers with Disabilities and Medical Conditions - from the Transportation Security Administration (TSA), including information about specific disabilities or limitations that might make it difficult for you to go through security screening at the airport. TSA Traveller Information - general information from the Transportation Security Administration (TSA), including: acceptable identification at the checkpoint; how to get through the queue faster; rules for carrying liquids; information about pat-downs; prohibited items; screening for passengers aged 75 and older; and traveling with food or gifts.